The game of Punto Banco is a close cousin to Baccarat. The only difference between the two is that, in Punto Banco, the player's only decision is what bet to make. Everything else is determined by the rules. Punto Banco, like Baccarat, is largely a high-roller game in casinos. It is not known if it became a high-roller game because it attracted wealthy gamblers or if it was successfully marketed to high rollers. In many casinos Punto Banco is played in a separate area of the casino to facilitate an aura of wealth and to shield the players from the regular casino patrons. Online, Punto Banco is accessible to everyone. There may be as many as 14 people sitting at the Punto Banco table, but each spread or deal involves only two hands, the player or Punto and the bank or Banco. It can be confusing to use terms like "player" to refer to a bettor and also to the single "player" hand. Similarly, the house is the bank for monetary matters; the casino pays winners and collects the bets from the losers. But the hand called "bank" has nothing specifically to do with the house. We will use "Punto" and "Banco" to refer to the two hands that compete in each game. We know that the game was created in pre-revolutionary Havana, Cuba. It was brought to the U.S. in the 1940's. But there is also a legend, from the pre-Roman Etruscans of Italy, surrounding the origins of the game. A maiden would roll a nine-sided die while nine gods prayed to her. If the numbers 8 or 9 came up the virgin would become a Princess; if 6 or 7 came up she would live on as a commoner; if 0 to 5 came up she would commit suicide by walking into the sea. In some casinos the game is played at a table similar to a blackjack table and a single dealer handles everything. At other casinos, each player, in turn, deals the cards and the casino provides three "dealers" to manage the game. In both cases there are only two hands, Punto and Banco. Before the deal all players place their bet: Punto, Banco, or tie. The goal is to reach a point count of 9 or come as close to 9 as possible. Two cards are dealt face down for both Punto and Banco. The Punto cards are revealed. They are added up: ace = 1; 2-9 are face value; 10-king are 10. When the sum exceeds 10, only the last digit is used, so, if a hand is king and queen, the sum is 20 which becomes 0, a very poor hand. 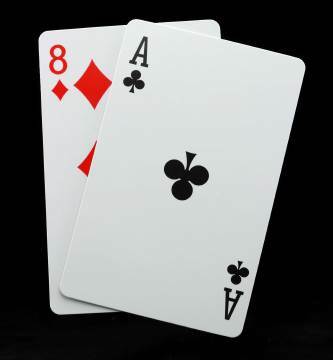 Picture and 9 is 19 = 9, the best possible hand. This is called a natural and wins automatically unless Banco also has a natural 9. A point count of 8 is also considered a natural. Punto wins with 8 unless Banco ties or wins outright with a 9. If neither Punto nor Banco has a natural the third-card rules apply. Punto is dealt with first. If Punto has a total of 6 or 7 he must stand pat. If Punto has 0-5 he must draw one card. Punto does not have the option to decide what to do. As with Punto's third card actions, Banco has no choice; his/her actions on the third cards are forced. Remember, you can bet on either Punto or Banco. All winning bets on Punto pay 1-1. All winning bets on Banco pay 1-1 minus a 5% house commission. If you bet on a tie and win, the payout is 8-1. If there is a tie, all bets on Punto or Banco are considered a push and are returned. The only strategy in Punto Banco is to never bet on a tie. The house edge is slightly better when you bet Punto so the best bet is Banco.